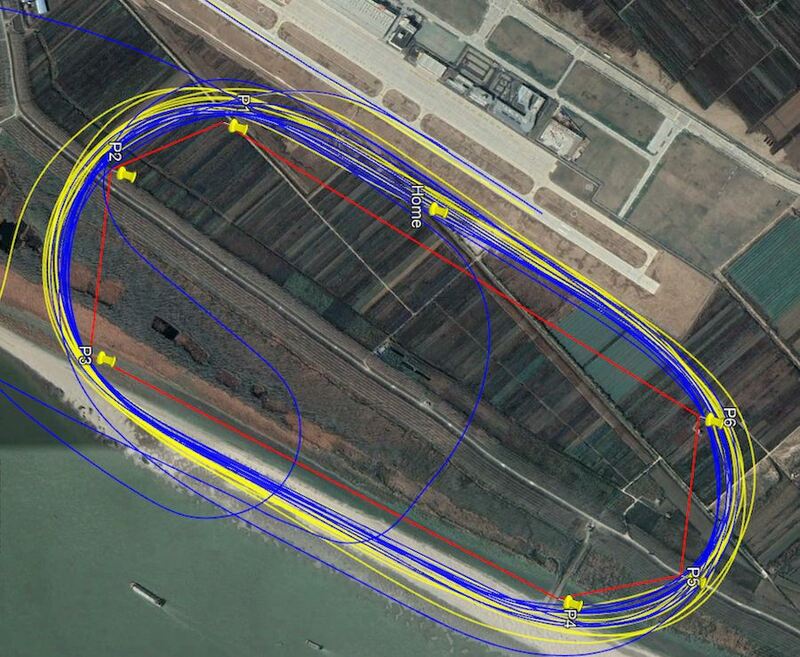 This image image shows the path Steve Senegal in Race 11 took during the Gold final race to win the first ever China Cup in Wuhan last weekend. This alternative image (click here) shows Race 11 Steve’s path alongside Race 99, shown in blue. The blue shows the path during the same race of second place pilot Tim Cone. This view shows Tim Cone flying a tighter, inside line than Steve. Steve was out in front of Tim during this race and didn’t need to pull a tight line close to the pylons. Tim typically strives to fly the tightest path around the pylons and can do it with his plane. However, it wasn’t enough to clinch the victory this time. The race speed is the established race course distance (3.06 miles/lap x 8 laps =24.48 miles) / time difference between when the plane crosses the home pylon at the start & crosses the home pylon to finish. Steve’s race speed of ~3mph faster is consistent with him taking the lead over Tim. The ground speed is the GPS calculated distance the plane flew / time difference between when they plane crosses home pylon at start & crosses home pylon to finish. From the flight line plot, we see that Steve flew an outside path as compared to Tim. The ground speed is ~14 mph faster for Steve – meaning that flying a longer path and winning – he was going really fast. You can delve deeper into the stats on the Facebook page of 51 Aero. 51Aero’s custom telemetry systems and flight data recorders diagnose problems quickly and accurately to measure and improve performance, analyze critical safety data and predict maintenance issues before they become dangerous.